1. Exercises colon: colon practice is a recommended form of exercise behavior in patients with constipation is not clear why. Patients are encouraged to hold a regular time each day to take advantage of bowel movements. 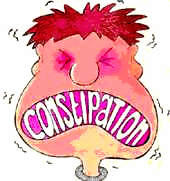 Recommended time is 5-10 minutes after eating, so it can take advantage of the gastro-colonic reflex to defecate. It is hoped this practice can cause sufferers respond to the signs and induce bowel movements, and do not withhold or delay the urge to defecate. 2. Diet: the role of diet is important to overcome constipation, especially in the elderly group. Epidemiological data indicate that a diet containing plenty of fiber, reducing the incidence of constipation and a variety of other gastrointestinal diseases, such as diverticular and colorectal cancer. Fiber increases stool mass and weight, and to shorten intestinal transit time. To support the benefits of fiber, it is hoped sufficient fluid intake of about 6-8 glasses a day, when there is no contraindication for fluid intake. 3. Exercise: adequate mobility and activity or exercise to help overcome constipation walk or jog is done according to age and ability of the patient, will invigorate the circulation and the stomach for memeperkuat abdominal wall muscles, especially in patients with abdominal muscle atonia.